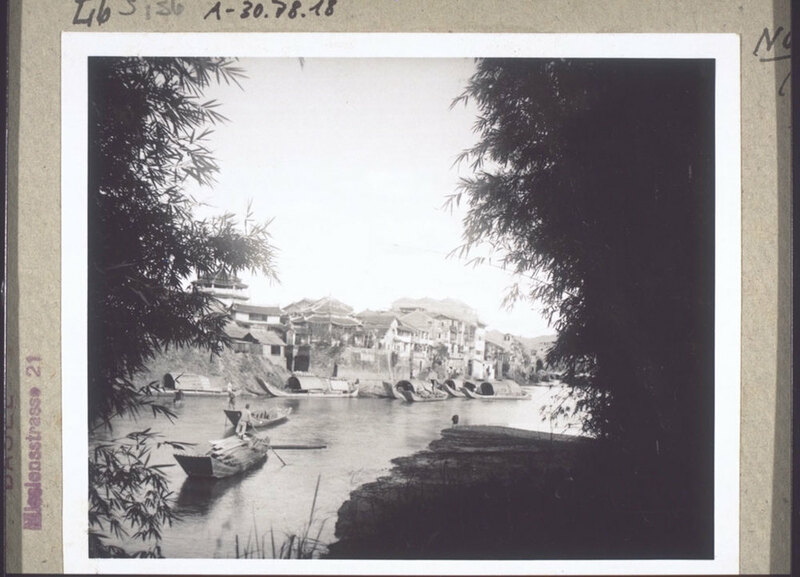 "View of the town of Kayin across the river." "[original caption] Blick über d. Fluss gegen d. Stadt Kayin." Uncertain how this picture corresponds to the geography of present-day Moiyan. "On the town wall of Kayintschu near the south gate 1913." "[original caption] Auf der Stadtmauer i. Kayintschu beim Südtor 1913." This picture astounded me - I had not seen anything like this during my time in Moiyan. Does anyone else recall seeing such a wall when they visited? Perhaps it was in a different town within Moiyan, or perhaps has been destroyed since this photo was taken. "In the main street of Meihsien." "[original caption] In der Hauptstrasse Meihsien." I enjoyed this little glimpse into an everyday scene with the kids running around. Note the man on the left in traditional shirt and the vendor balancing his wares on his shoulders. "[original caption] Steinbogen in Kaying." "The new bridge over the Moi River in Kaying, under construction, 1935." "[original caption] Neue Moi-Brücke in Kaying im Bau. 1935." This very same bridge is now the oldest-surviving bridge in the Mei Urban district area!